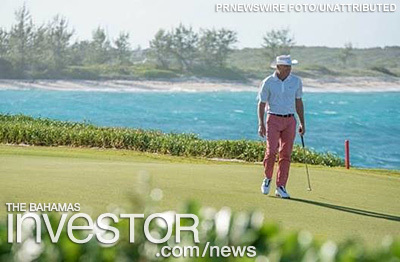 MONTEGO BAY, Jamaica, January 2019 /PRNewswire/ — Sandals Emerald Bay hosted the Bahamas Great Exuma Classic – the first PGA Web.com Tour event of the year – from January 10-16, across its 500 acres on the unspoiled island of Great Exuma. Marty Dou was named winner after conquering one of the most renowned courses in the world, the Sandals Emerald Bay Golf Course. Designed by golf legend Greg Norman, the award-winning Sandals Emerald Bay Golf Course is recognized as the longest and one of the most scenic 18-hole, par 72 ocean-side golf courses in the Caribbean. Greg Norman (pictured) played the 18-hole course he designed alongside Web.com players and golf enthusiasts in the Pro-Am before the professional Web.com Tour kicked off on Sunday, January 13, with Greg Norman’s ceremonial tee shot. While the players enjoyed the beautiful weather and challenging fairways, spectators with the Presidential Pro-Am Players Package were provided with a Golf Channel All-Access Pass, which included a behind-the-scenes production tour during live TV coverage of the Web.com Tour. Web.com players also had the opportunity to join up with the Sandals Foundation – the philanthropic arm of Sandals Resorts International – to make a meaningful contribution to the local community. Ryan Brehm and Michael Johnson attended a Reading Road Trip excursion at Roker’s Point Primary School, where they read with local children, while Rico Hoey and Paul Imondi helped local children perfect their swings at a Nelson’s Rangers golf clinic. Sandals Emerald Bay is excited to announce it will host the 2020 PGA Web.com Tour for a fourth year from January 9-15, 2020. Golf lovers can book their stays for the 2020 tournament as part of Sandals® Resorts’ signature LIV+ Events program, which affords guests incredible inclusions across passion points including music, culture, sports and volunteerism. Beyond the green, guests will enjoy all the indulgences that come with a Luxury Included® vacation, including a private mile-long beach, three swimming pools, unlimited land and water sports, unmatched luxury accommodations, and 5-Star Global Gourmet dining at eleven specialty restaurants. To learn more about the award-winning Sandals Emerald Bay Golf Course, please visit sandals.com/golf/bahamas. To learn more about the Bahamas Great Exuma Classic at Sandals Emerald Bay, please visit sandals.com/pgawebcom. To learn more about Sandals Emerald Bay Resort, please visit sandals.com/emerald-bay/. Government is looking to establish a public private partnership to redevelop and operate Nassau’s premier cruise port. 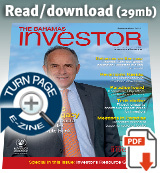 Watch an interview with Tourism and Aviation Minister Dionisio D’Aguilar here. Minister of Financial Services, Trade and Industry Brent Symonette gave an update this morning on the government's plans to transform The Bahamas into an arbitration hub.